Luis Duarte Materia Tinto 2016 - Vinho Regional Alentejano - Vidigueira - Portugal (0,75 l). Nuanțe de note florale, prune usucate și stafide. Arome profunde și intense de fructe roși, fructe de pădure cu final lung și catifelat. Climate - ‘Continental-mediterranean’, characterized by a low-rainfall, semi-arid growing season and high daytime temperatures. Good summer and pre-harvest thermal amplitude. Soil characteristics - Magnesian sedimentary loam soils, ranging from sandy-loam to clay-loam with marked horizons. Many areas comprise soils with laminar clay-schist-like characteristics. Whilst very low in organic matter, the acidic, or slightly acid soils have average fertility and a high water retention capacity. Grape Varieties: Trincadeira; Touriga Nacional; Aragonez. WINEMAKING - Grapes are hand-selected on a purpose-built selection table; The fruit is instantly cooled to 10ºc on arrival at the winery; Musts are ‘cold-soaked’ for up to 2 days prior to fermentation; Innoculation with selected yeasts; Prolonged fermentation and maceration in ‘lagares’ (traditional open fermenters); Aged in new French oak barriques. 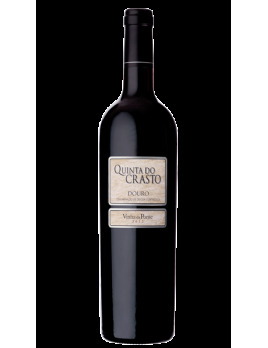 Tasting Notes - Deep, concentrated plummy-red tones; Complex aromas. Mature well integrated fruit. Full-flavoured, good concentration, soft tannin structure. Should be served at 14 a 16ºC; A perfect accompaniment to Mediterranean dishes.